It is a rare art show these days that proposes a concise and interesting thesis in the artist’s printed statement, and presents work that delivers on its promise. In Surface/Texture, Casper artist Linda Ryan offers a cohesive body of work that articulates her “love of the physicality of materials and objects, both natural and manufactured, as a means of aesthetic expression.” The sculptures on display, comprising cast textures conjured from plaster, cement, and metal with the occasional found object, do that. Her artmaking is simultaneously an intuitive and intentional process of selection, metamorphosis, and arrangement of relationships among seductive objects. 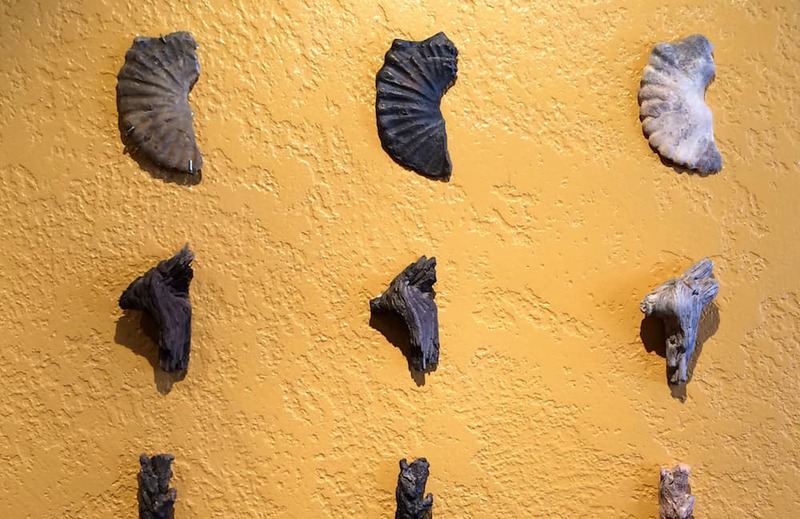 Ryan’s artistic process transforms discarded and disregarded fragments from our surroundings, revealing their beauty so that we may love them too. Composed almost exclusively of relief sculptures jutting a few inches from the wall, most works are arrangements of small units, usually in grid formation. The repetition of small shapes lends magnitude, as when the repetition of a prayer or mantra swells its power. Repetition also attracts attention to nuance, to the variation within the pattern. Attention is rewarded, in this case, with numerous tiny revelations. Two approaches emerge. The first is repetition of a single form in different materials to dramatize metamorphosis. The second is repetition of a single material to capture slightly different aspects of a place or thing. In both, Ryan celebrates the underfoot and overlooked. Her excellent craftsmanship and eye for detail bestow a purity and austerity to gnarled patches of tree bark, crumbled bits of glass, and square inches of pavement. Ryan compares her overall process to the musician composing variations on a theme. Little Brother/Guardian/Grandfather consists of three fragments of tree bark ranging from palm- to dinner-plate-sized. Just one is actual bark; the others are cast bronze and cast iron, treated to closely resemble the real thing. Mere linear transformation is extrapolated into chart form in a neighboring work, Sequences. An austere vertical display, approximately three by five feet, columns of five objects appear in three versions, reminiscent of a monument or archaic proclamation. 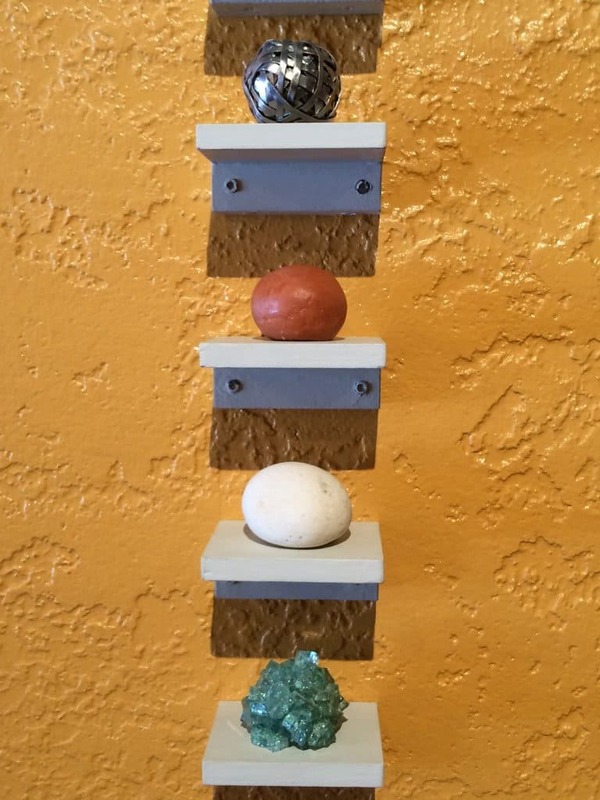 A chunk of black coal, a fossilized shell, a pine knot, a splinter of wood, and a flat piece of sandstone repeat themselves in cast bronze and cast ceramic. The care and attention given to the reproduction and arrangement of these random organic items pulls us in for a closer look. It turns out they are not just interesting; they are lovely. The most sensuous are the cast plaster blocks, and there are several collections of these. Day at the Beach/Ochre Beach is a modest grid, two rows of four simple but inviting squares. Each plaster block is approximately four inches on a side and about an inch thick. The smooth plaster is subtly tinted in either warm white or tawny ochre, and the blocks are slightly irregular, as if still in a gelatinous state. Each block has a small recessed central square. One must approach closely to appreciate the textures cast from impressions of the ground deep within these windows. 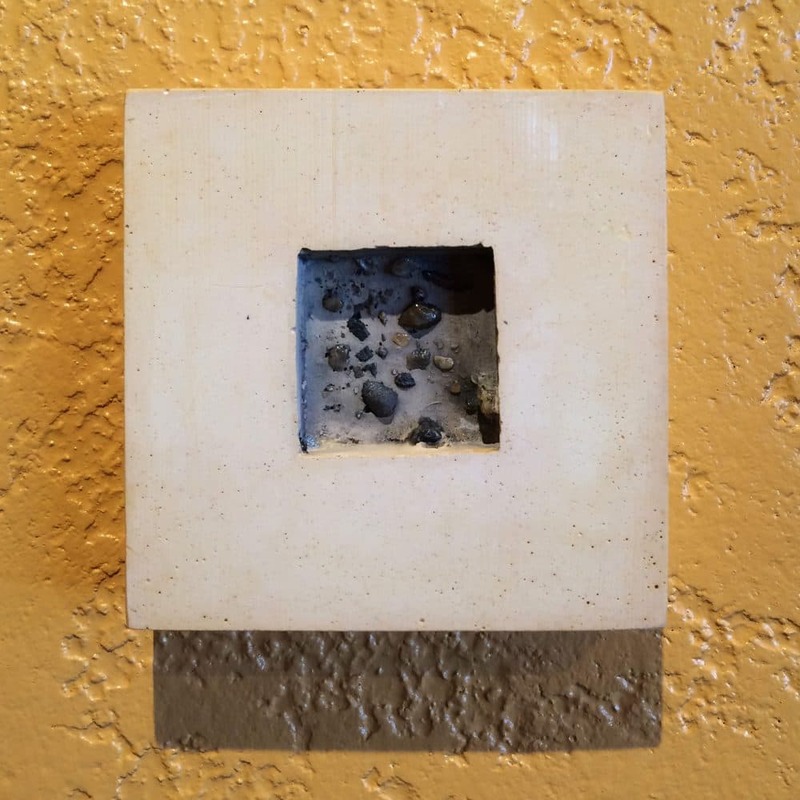 Embedded with pebbles, grit, and enticing textures, the captured samples are so intimate that the viewer feels as if she is hovering face-down an inch off the earth. These pieces surprise with their serene, almost devotional aura, and their tactile qualities made it difficult to keep from stroking each of them. Another grouping of cast plaster blocks, One Summer Day: Home/ One Summer Day: Studio/ One Summer Day: Work, is a grid three rows tall and five columns wide. These blocks, though of the same size and refined craftsmanship, appear more pristine than those in the previously described work, with pure white plaster surrounding the central recessed window. These inner squares contain pale textural impressions taken from the ground at the sites named in the titles. The textures are subtle. One must examine each carefully to perceive the quiet drama in the smeared cracks, jagged breaks, and worn flotsam honored here. 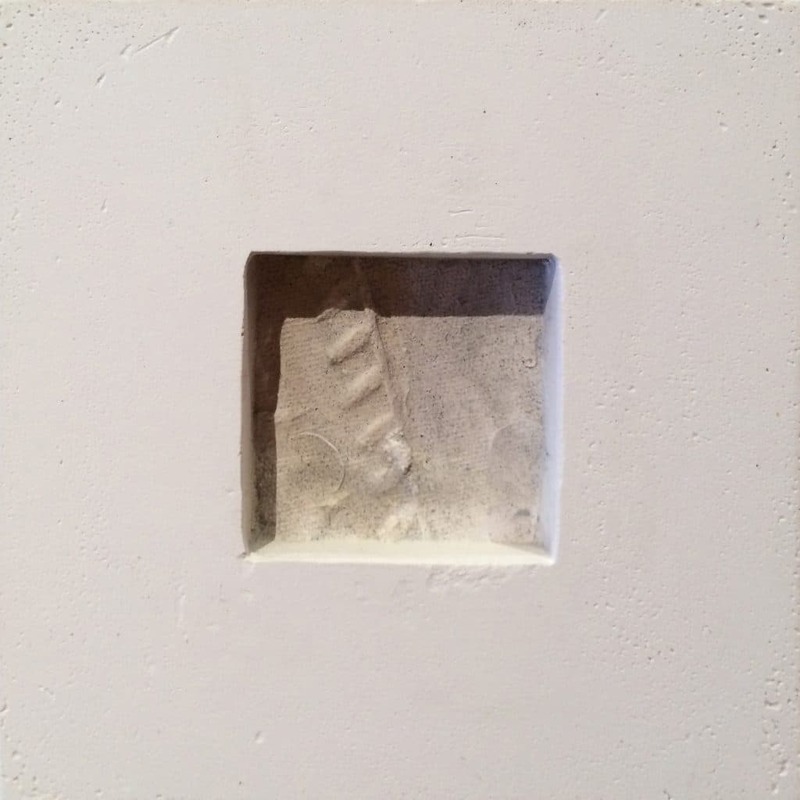 In many of the cast plaster works, an occasional leaf or stone, lifted in the process of taking the impression, remains as “surprise media” that Ryan considers a valuable part of memorializing the quotidian. 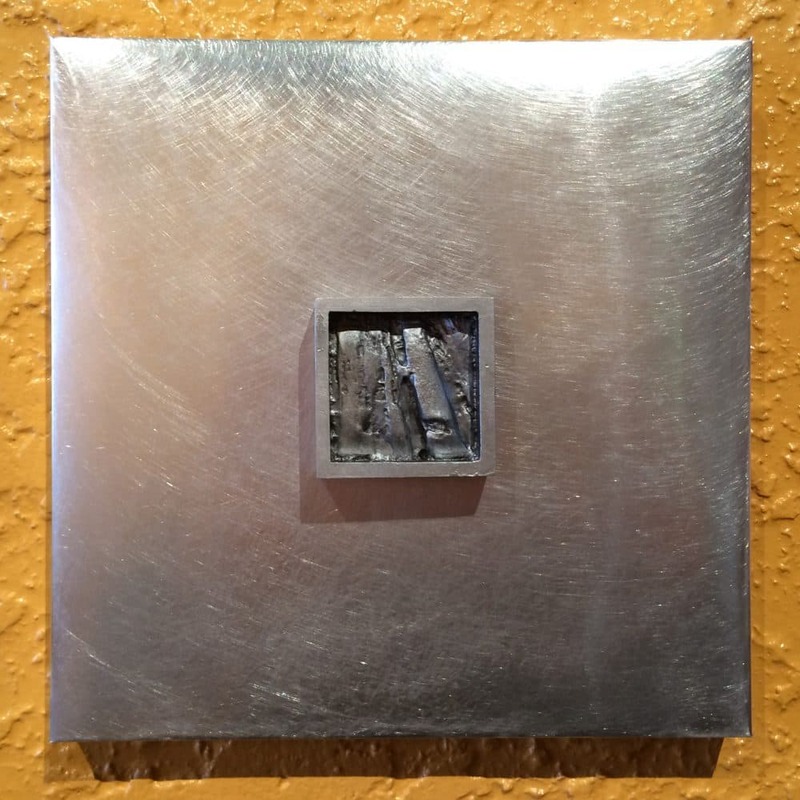 A related but quite different work in cast aluminum is Texture Studies, a grid of 16 approximately six-inch squares with brushed metal surfaces. Each shiny panel is less than half an inch thick, with a central square window that, instead of being recessed, thrusts out from the metal face. As in the plaster groups, the central square presents an interesting cast texture in the same material (in this case, darkened aluminum). But here, a sleek metal skin and the jewelry-like quality of the boxed textures elevate a humble subject matter to the cool and classy altitude of high-end design. It was their tactile richness that attracted me to this work, and the artist herself surely found it enchanting as well. In a space where touching is forbidden, this was a cruel tease. The artist made some unusual choices about selling the work by pricing each piece separately. This makes the work much more accessible to own, gift and continually benefit from a serene meditation on the blessings — and surprises — of the ordinary. This exhibit represents an outpouring of powerful new work from an artist who rarely exhibits, but has dedicated the past 35 years to her students at Casper College. Now, she has mounted two solo shows within 4 months. This show is a subset of the August 2016 exhibit at Art 321 in Casper, supplemented by pieces selected at the artist’s studio by Mystery Print owner David Klarén. See Surface/Texture until Feb. 4, 2017 at Mystery Print Gallery & Frame, 221 S. Sublette Ave, Pinedale. (307) 367-3473. The gallery is open from noon-6 p.m. Tuesday through Saturday and by appointment. the internet address is mysteryprint@davidkklaren.com. Sue Sommers is a painter, book artist and printmaker who lives on a cattle ranch near Pinedale. 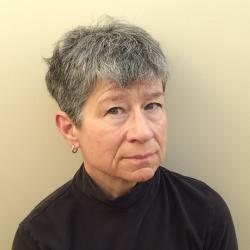 Sue Sommers is a painter, book artist, and printmaker in Pinedale, and a regular contributor to Studio Wyoming Review. Great story on very interesting work. Wish I could see the exhibit! Great story, Sue! Well done! Thank you Tammy, for the productive conversations we continue to have about art!